This article – part of a two posts series – first appeared on: The Financial Brand thanks to Jim Marous. 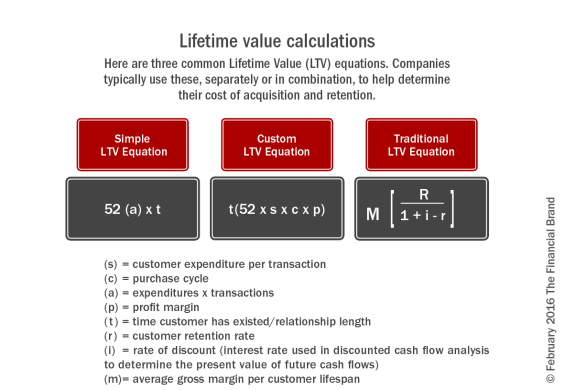 Looking at the concept of consumer lifetime value (CLV) in a little more detail, the tenant that underpins the notion is that “some customers are more equal than others”, and it measures long-term value over a current quarter’s profit. Boiled down to the basics, it takes the present value of the future cash flow (profitability) attributed to a customer during the entire potential relationship with the bank. In other words, the profitability of loyalty. When there’s a fight for increasing deposits in a low interest rate environment, and interest generated revenues are tight, cultivating CLV is a strategy that directly works to grow wallet share, especially amongst market segments where wallet share is low. There’s a direct correlation between additional marketing spend to target high potential CLV customers who currently have low wallet share with the bank. There is one paradox in all of this, and that is a sense of customer apathy – the effort it takes to switch bank accounts. Customers may not be as apathetic as predicted.For instance, when the UK launched the initiative in 2014 to make switching current accounts easier, nearly a quarter of a million account holders switched as they looked for better offers, service, and loyalty programs. In fact, some banks launched new loyalty rewards to try to stem to leak, with some success (interestingly, when the switching surge ended, the vast majority of market shares among the primary banking organizations remained the same). Let’s look at the peer-to-peer alternative lending market and the growth of P2P payments, and how consumers are willing to abandon traditional bank offered products in search of a better priced, more customer-friendly option. Ernst & Young published a report in 2014 on the staggering growth of P2P lending (both for consumer and business). With nearly a 75% growth rate year over year, the P2P lending surge cannibalized a considerable chunk of the bank lending market. That growth was fueled by consumers jumping ship to set sail with alternative lenders. This growth in the P2P lending market shows no signs of slowing down. P2P payments is another, some say better, customer service experience alternative, with nearly $90 billion worth of customer transactions leaving the traditional bank market. Both of these P2P alternatives represent potential profitability that traditional banks are losing, with the resultant negative impact on the lifetime value of the customer caused by a fractured, multi-point, conglomerate of service providers. Fascinating idea and a good read! Ignoring some of the tactical complexities for a moment, what about the regulatory side? How would regulators act if pricing was not only based on your specific risk but also some expectation of your future (which may be, at least partially, subjective)? Is there a risk that this could further lock some out of the financial markets? you bring a very valid point. the constraint of fair lending practices for example, limits what a bank can do with dynamic pricing.